Who knew making your own crackers could be so easy and satisfying! 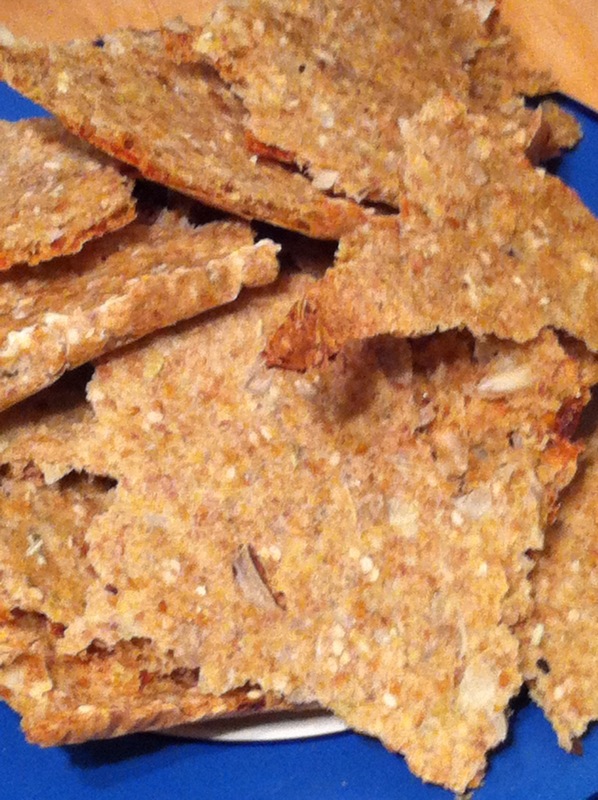 Check out these flax and millet crackers. Vegan, gluten free and full of fabulous ingredients these crackers are a great way to save some dough (haha) and impress your friends. They’d be great with lentil dip, hummus or some almond butter (I just discovered crunchy almond butter – Oh. My. God!). You could serve them with a quick picnic salad, some antipasto or tapenade or dunk them in a hearty soup. So many options! Why flax seeds? Why not! Flax seeds are the highest source of alpha-linolenic-acid (ALA) the plant based omega 3 fatty acid. ALA is anti-inflammatory, excellent for cardiovascular health, skin health, hormone health, you name it! Flax seeds also contain lignans; fiber like compounds which act as antioxidants and phytoestrogens (less potent that animal based hormones). Flax seeds provide mucilage or water soluble fiber (which is why they make a good vegan egg replacer in baking). Mucilage is going to help you eliminate toxic build up in the body (including circulating cholesterol and estrogen). Mix all ingredients together. If it is runny allow it to sit for a minute to thicken. Line two baking sheets with parchment paper. Spread the batter out as thinly as possible to create crispy crackers. Season with pepper and more sesame seeds if desired. Bake for 20-30 minutes until golden brown. For even crackers cut immediately. Otherwise allow to cool and then break up into pieces. Store extras in the fridge. This entry was posted on August 12, 2012 by katelivingfull in Nutritional info, Savoury Recipes and tagged blood sugar balancing, dairy free, flax seeds, gluten free, sesame seeds, snackable, sunflower seed, vegetarian.